Is a Greek departure from the eurozone imminent? The smart set in the world media seems to have decided overnight that it is, but I’m not so sure. The key player, pictured above, is Alexis Tsipras, the 37-year-old leader of Syriza, the Coalition of the Radical Left. Greek politics has long been dominated by two main parties, the center-right New Democracy and the center-left PASOK, both of which are more patronage networks than real ideological parties. Then off on the far left was a Communist Party. That party, like many European Communist parties, split between a Moscow-dominated faction and a more independent-minded Eurocommunist tendency. Syriza is a coalition of far-left parties with the Eurocommunist faction of the old Communist party at its helm. Tsipras, at the age of 37, is obviously too young to be a cold warrior but the point is that the party’s origins are outside of the Greek mainstream. Except that at the most recent elections Syriza emerged as the second-largest party—bigger than PASOK—and even a New Democracy/PASOK grand coaltion couldn’t govern without Syriza participation. Syriza refused to participate, and Greece now looks to be headed to new elections in which Tsipras will do even better. Well on the face of it, his policy makes no sense. He says he rejects the E.U.-imposed austerity program but wants to stay in the euro and in the European Union. But Greece has a large primary budget deficit and no source of market financing. The E.U. is insisting on an austerity program, but it’s also giving them cold, hard cash in the interim. Reject the austerity program and you lose the E.U./IMF money and need to implement an even harsher austerity program. Tsipras is a bit like a guy standing in your living room threatening to blow his own brains out unless you pay him money, a proposition he offers on the theory that you’d rather not see your furniture ruined. So that’s the line. 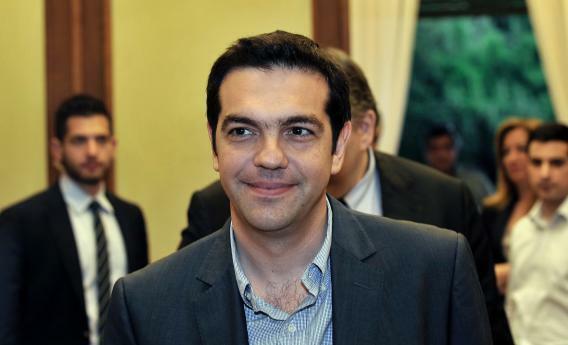 Tsipras can shoot himself if he likes, and nobody will stop him. The hope is that faced with the decision, he won’t pull the trigger and eventually a coalition grand enough will emerge to tell the Greeks to be “responsible” and accept the austerity. But the fact of the matter is that cleaning the carpet after Greece’s brains have spilled onto everything is in fact going to be more expensive than just paying Greece off. Giving Greece a bigger bailout will be politically unpopular but in practice the SPD won’t criticize Merkel for doing it. By contrast, if she pulls the plug and things end up going badly they will hit her for that. The complication is that the politics are thornier in the smaller European countries such as Finland and Slovakia. But if I were a betting man, I’d say Greek euro membership survives as a Tsipras victory. The real potential challenge to the euro comes from Rome and Madrid, where the governments aren’t getting E.U. bailout money and it’s much less clear that membership is beneficial.